The Supervisor panel allows you to monitor current online support activities. As a supervisors or team leader, you need to know what's the status of all the threads waiting for service or threads that are in progress (assigned to agents). Thanks to the Supervisor panel, team leader can see information such as: all logged users in specific teams, number of threads on different stages (new, assigned, replied, closed, etc. ), average time of supporting thread. how many threads are tagged with specific statuses. manage priorities - change the priority of a thread (move it from simple queue to priority queue and vice versa). Team stats and Queue management tabs are available only for users added as supervisors in teams. What does Overview tab in Supervisor Panel include? 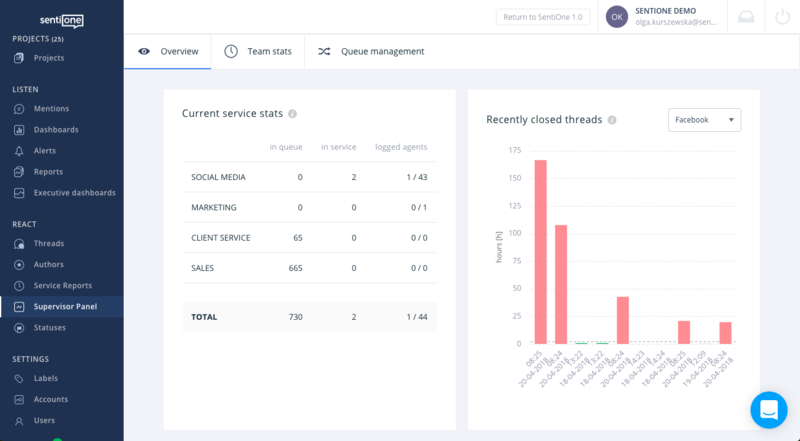 Table presents the number of threads in a queue and in service in a given team, as well as the number of team members online. Chart presents 10 recently closed threads for a given source (horizontal axis: thread's closure date; vertical axis: time of service for a given thread). Legend: green - service level has been fulfilled; red - service level has not been fulfilled. Chart presents the percent of threads serviced with the required service level. If no thread was closed in a given period, service level would be 100%. The dashed line indicates defined service level. Chart presents service level per team, restricted to specific source and given time period. Legend: green - service level has been fulfilled; red - service level has not been fulfilled. Chart presents the number of threads that were created and closed during given hour (data for last 24 hours). Chart presents the average number of threads opened / closed during given hour - values are counted based on the number of opened / closed threads from a given period, like current week. What does Teams stats tab in Supervisor Panel include? Table that presents number of threads in service by a specific user in a given team, with their assigned status. Table that presents the number of threads in service by a specific user for a given time period (e.g. current month), as well as the average time of service. Chart presents the number of threads that were created / closed, during given hour (data for last 24 hours). What does Queue management panel include? Supervisor can check how many threads are waiting in queue for specific teams. There are information about priorities (it depends on the topic’s priority in routing), time of waiting (since it has been assigned to the team). Supervisor can open the thread to check if it’s more or less important and change its priority/assign thread to another team or to a specific user manually. Supervisor can view all threads which are currently in service. Besides checking priorities, they can also check who is assigned to a specific thread, how long the thread is in service, what the current status of the thread is. When a thread is marked with red colour, it means that the service level has been exceeded. The supervisor can assign the thread to another user if it’s needed. Note: for accounts without Advanced routing, there won’t be any threads in the Awaiting Queue displayed (unless you assign threads to teams manually and then they are assigned to users for example by themselves or by the supervisor). However, you can use “In Service” mode to control how long specific threads may stay in service and reassign them if needed.